Cornish-born naval officer and Pacific explorer Samuel Wallis (1728–1795) served as a midshipman and master's mate, was commissioned as a lieutenant in October 1748 and received his first command (a 14-gun sloop, HMS Swan) in June 1756. From there, he moved upwards through the 24-gun sixth rate frigate Port Mahon (April 1757) to the 60-gun Prince of Orange (September 1758). 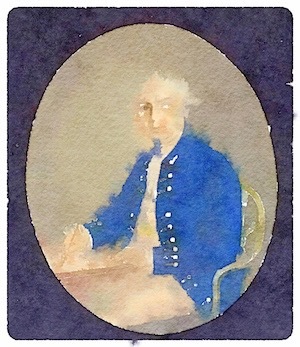 In the latter, he took part in the Quebec campaign under Vice-Admiral Charles Saunders, wintered in North American waters, then returned to home waters until the end of the Seven Years' War. Meritorious service during the War and Saunders' presence as Second Lord of the Admiralty may explain Wallis's appointment to the 24-gun frigate Dolphin in the wake of Commodore John Byron's circumnavigation, but the voyage became Wallis's sole claim to fame.